Nottingham Forest temporary manager Paul Williams has left the Championship club. Williams was a first-team coach at Forest but replaced Dougie Freedman as boss when the Scot was sacked in March. 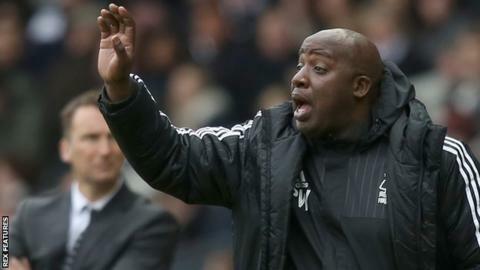 The 45-year-old was out of contract this summer and BBC Radio Nottingham understands he has failed to agree terms on a return to a coaching job. Williams, who won two of his 10 games said: "Although we struggled with results, performances were strong." The Reds finished 16th in the table, 19 points adrift of the play-off places and 15 points clear of the relegation zone. "The lads gave me everything they had," Williams added. "They, along with the staff, are a good honest group and I will always appreciate the commitment and desire shown during my time here. "This club has so much potential and, when you see the backing the club receives from the supporters both home and away, I truly hope they are rewarded for their loyalty with success on the pitch."